The New Year swept in frigid wind and icy rain, beginning a week of temperatures below freezing each day. On New Years Eve I drove out to the barn to blanket Willis and a friend’s horse, Enzo. The sky was a blanket of clouds as I pulled out of the driveway, the temperature dropping with each mile on Hwy. 290. By the time Daisy and I reached Scattered Oaks it was 36 degrees; icy moisture sprayed our faces. Willis stood near his shelter as I entered the gate, eyeing me warily. Usually he walks up to me, but not this day. I had ridden him with spurs the day before and I sensed he was pretty unhappy with me. As I approached he took off toward the far end of the paddock through the mesquite and oak trees, running with more energy than he’s shown in a long time. Maybe the cold felt good. He avoided me, circling and cantering, back and forth along the ribbon fence, and finally stopped. There was a chance to graze at the end of that lead rope. Once in the barn, I brushed and cleaned his hooves before fitting his blanket over his soft, fluffy coat. His blanket is lightweight, recommended by the American Quarter Horse Association, and for the first time I wondered if it would be enough in this frigid weather. It would have to be. Bought when he was four years old, the blanket fits a little tightly now, showing small tears near the rump. Fortunately, Willis doesn’t need it often. As we stood in the pasture, Willis munching green grass at the edge of the round pen, I shivered, my fingers numbing by the minute. I thought about how grateful I am for Jim, who would be chopping ice out of the water troughs in the morning. This is winter. I wished for it. Even cold as it was, Daisy and I still stopped at the East Metro Park to walk around the little lake and look for great blue herons. Ducks floated at the water’s edge, sheltered from the wind by trees. The wind blew and blew. A few hearty souls fished – a man and his young daughter, and another man. It must take a great deal of patience and fortitude in this weather. By evening sleet covered cars and the temperature sank below freezing. The next few days stayed cloudy, rainy, and cold. I waited until the temperature was at least 30 degrees to walk Daisy. Bird baths stayed frozen for days; Tunie’s water froze. I’m glad she has a new bed. She retreats to the garage each evening and hunkers down away from the cold. Wednesday brought sunshine and thaw. The barn was crowded with boarders taking blankets off and squeezing in a ride. I walked Willis around in the fields and he seemed happy to be out of his paddock. And his blanket. 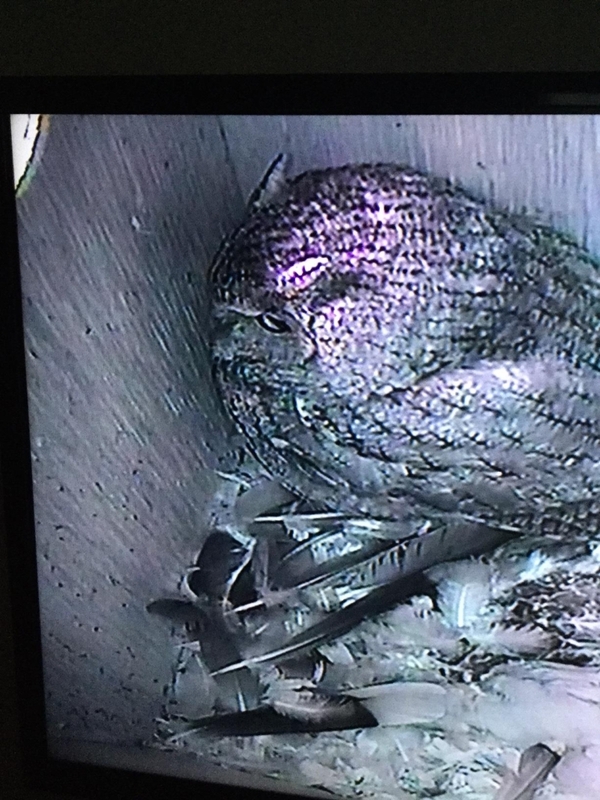 Saturday night Tim installed a new camera in the owl box. We both dreaded the ordeal, but it had to be replaced because a light bulb had burned out, so nothing was visible in the box at night. We waited until after dark to make sure the owl had left and began loosening bolts and screws. Tim pulled out the pipe shielding the camera wires and gradually pulled the box down just low enough to reach its opening on a ladder. After installing the new camera, we checked the angle and function. The picture is much sharper and brighter than its predecessor. 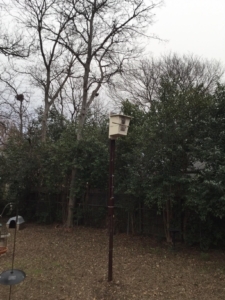 Tim sprinkled fresh cedar shavings over the bottom of the box which was covered in feathers and we raised he box back into position, slowly and painfully, nudging the pole up through the brackets. Lowering the box was a lot easier than raising it. 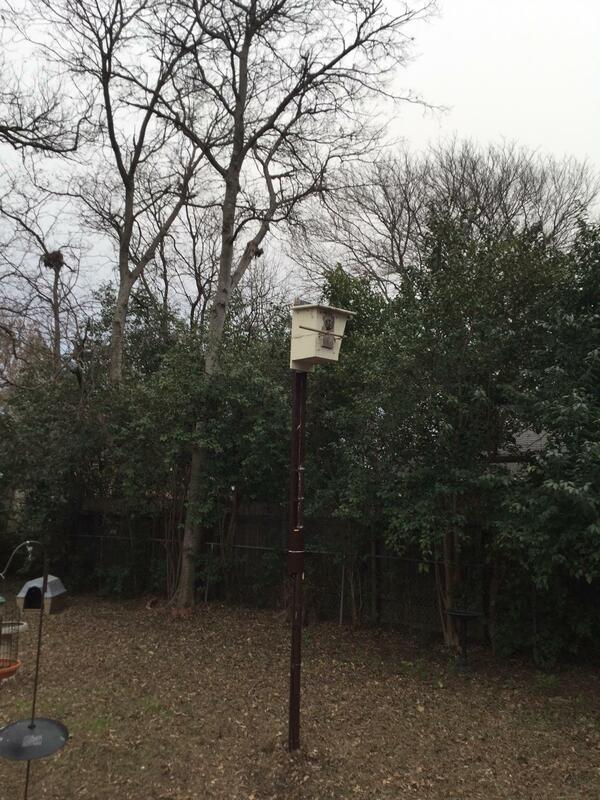 I tapped on the brackets to loosen them as Tim pushed the pole up, moving the box up, half inch by half inch. By the time we were done it was almost 9:30 p.m. The next morning the owl was looking out of the box, as if nothing had changed. Nicely written Christine. You take good care of all your animal friends. Hopefully that camera will last for a while, not our favorite job eh? Let the nesting season begin.